I had a wonderful box of canvases and accessories arrive from Amy's Golden Strand this week. The eagerly anticipated Home Study - Royal Pain in the Tudors - canvas, threads, stretcher bars, and stitch guide was the first to be unwrapped. 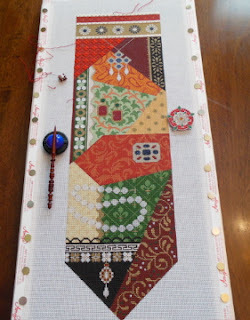 For the Home Study, Amy has chosen this intriguing banner from JP Needlepoint Designs that incorporates textile pattern sections that represent each of Henry VIII's six wives. We are starting with the Anne of Cleve's section up at the top of the canvas. Amy has designed a fabulous six step stitch pattern for the red triangular area. This week I completed the three rows of plaited ribbon design and most of the first step in the red fabric area. So far, so good! I think most of you would agree with me that we enjoy our accessories as much as we enjoy the project we're stitching. Is that ever the case with this new Home Study! First of all, Amy included with this first kit a beautiful, large Tudor Rose magnet. It's wonderful to have a large magnetic surface with which to work. The next two fabulous accessories that arrived is this set is from Merry L. Prints. 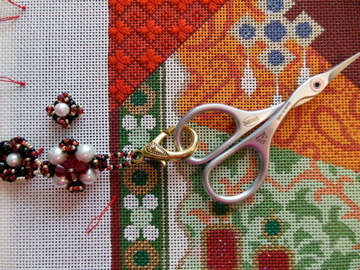 She has designed a magnet and scissor fob set for each of the six wives. This set is Anne Boleyn. This set is absolutely beautiful - pearls with black, garnet, and gold beads! Very regal and fit for a queen! The fob is attached to my sleek Italian Ring-Lock scissors. I just ordered another pair because I don't want to ever be without these scissors! 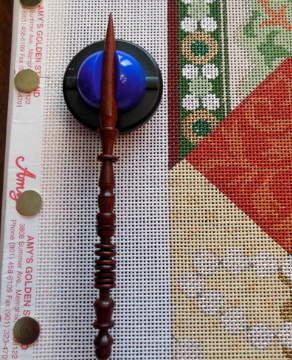 My dear stitching friend, Linda, gave me this incredible wooden laying tool last year. This is the Henry VIII laying tool. The tool comes with such an interesting description of each section of the tool and how it relates to the story of Henry and his wives. The perfect accessory for this project! 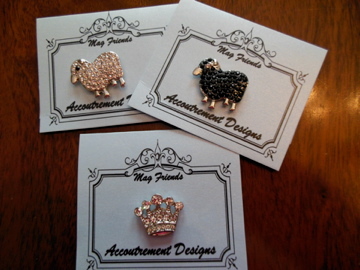 All of these accessories are available from Amy's Golden Strand in Memphis. One other Tudor accessory for which I don't have a picture is my iPad with the Netflix series - The Tudors. 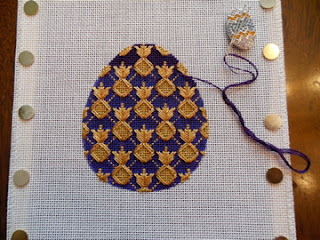 This series is a fun companion while stitching. 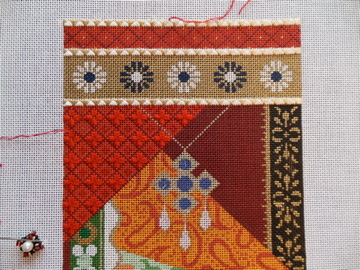 It's a great series even if you're not stitching a Tudor themed project. I ordered a few more fun magnets which also arrived this week. I just realized that I forgot to take photos of my new Melissa Shirley canvas and my new book that also arrived from Amy's this week. I'll save those to show you next week. Until the Home Study arrived this week, I was moving along with my stitching on the latest From Russia with Love egg and the Bargello Egg. I love both of these projects! I look forward to wrapping up both of these in the next week or so. I am determined to have a great display of eggs for the Easter season next year! I hope you will enjoy following along with me over the next several months as I stitch my new Home Study. 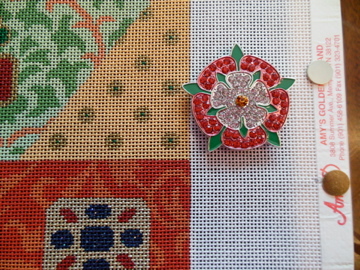 With Amy's excellent stitch guides, I'm sure there will be no royal pains involved in stitching these Tudor designs! What a great box! Do you know where Linda bought your laying tool? I know someone who would love it. On a non-stitching note, my husband and I went to the Ponte Vedra Inn after reading about it on your blog. FABULOUS place. Already planning on a return trip. Thanks for sharing your stitching and travel adventures. I always look forward to your weekly posts. Great progress on the Tudors. Love all your stitching accessories. They always make the project fun. Your two eggs are beautiful. I am looking forward to seeing your progress! Oh, my goodness! You had a lot of needlepoint to report on. I thoroughly enjoyed it. Have a great week. I am so looking forward to your progress on the Tudors. You stitch so eloquently and your blogging brings it to life. Jo Ann Jackson replied to K.B. 's discussion August 2016: Jury duty in the group Stitching Games 2016! I love to needlepoint, read, cook, and garden. But I'm also just as happy to watch golf, football, and NASCAR on television. I live with a beautiful gray and white cat who adopted me. 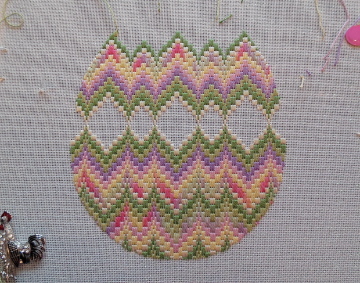 She resents the amount of time I devote to needlepoint.